We arrived home Sunday night from a fantastic weekend at The Philadelphia Marathon. 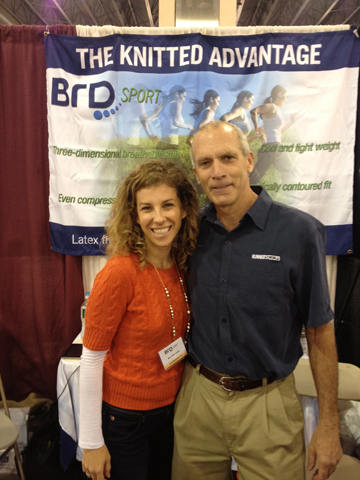 It was quite a whirlwind, so much fun, so inspiring, and such a complete pleasure meeting and greeting all our Philly-area fans and friends, new and old, at the BRD Sport Fitting Station, which we debuted at the Philadelphia Health and Wellness Expo. A huge thrill for us was meeting Bart Yasso, Chief Running Officer for Runner’s World magazine. We had a great time telling Bart all about our products, how the unique combination of three-dimensional knitting and level two compression are what makes us so superior to other products on the market. Another exciting and impressive visitor to the BRD Sport booth on Saturday was Caroline White who ran 2:37 Boston Marathon that pre qualified her for The Olympics. She Caroline came to us because her PT said she needed to get a knee brace, and before she left, she told us she wasn’t sure if she was even go to race on Sunday! We caught up with her after the race and this is what she said ,”Thank you so much for the brace! I was able to race and finish. My PT said that racing looked doubtful for me going into the weekend given my bruised knee joints, but the brace made everything come together and I was able to have a good effort”. The Expo is visited by thousands of marathoners, so BRD offered runners and guests the opportunity to be professionally fitted for our innovative supports by a staff Physical Therapists, led by BRD’s own Dr. Daniela Walsh. Ourteam spent time educating attendees on the advantages of wearing a properly fitted orthopedic support, such as reduced swelling, vast improvements to injured joints and joint stabilization. Dr. Walsh also analyzed peoples injuries, directed visitors on the proper care for their injuries and offered the opportunity to test and purchase products for personal use. As a result, hundreds of runners and walkers wore BRD Sport braces Saturday and Sunday for the marathons. Just a note.. I was the one with the sprained ankle on Friday night at the expo. I did what the PT told me.. iced, elevated and rested. I was able to complete the full marathon with the brace on! Thank you so very much for helping me do that.. I honestly don’t believe I would have made it without the brace. We thank YOU, Doreen…and Congratulations on your fantastic finish!! A couple stopped by Friday night and the man purchased a knee brace. Early the next morning they were back – the man had a smile on his face and huge thank you! He purchased another ankle brace for himself and based on his praise of the product, his wife had to get knee and ankle braces for herself. All of this is so exciting for BRD Sport—we can’t tell you how rewarding it is to know that we are helping people feel better and continue enjoying the active lifestyle they love. Thanks to all of you who stopped by to see us in Philly this weekend. We are already looking forward to next year! And please remember, we want to hear your stories, so we encourage you to take part in the BRD Sport “Back On Your Feet!” Challenge. Please reach out by email (mica@brdsport.com), tweet us or Facebook us to share your personal story. Happy Thanksgiving wishes to all from BRD Sport!